and finally boarded the ferry on Monday afternoon in brilliant sunshine. After a crossing as calm as the proverbial millpond and a slow and stately journey up hill and down dale (the van was very heavily laden this time) we finally arrived not long before midnight. Brushing aside the cobwebs (the spiders really have been busy over the winter) we fell into bed and woke up next morning to another warm, sunny day, perfect for starting to clean the house and empty the van. While DH hoovered up cobwebs, I started to unpack bags and boxes and try to remember where I’d stored their contents in previous summers. This familiar routine was rudely interrupted when I switched on the bread machine to make some fresh bread, whereupon there was a loud crackle and sparks flew out from round the base, together with a strong smell of burning! I hadn't any choice but to turn all the ingredients into a mixing bowl and by following the instructions on the back of the flour packet I managed to produced a very authentic-looking and really tasty boule – a traditional round French loaf. I even got the crust crisp by doing the ‘tin with water on the floor of the oven’ trick. I can see making bread by hand becoming a regular occupation. Back we went to work, only to be interrupted again, very pleasantly this time, by the arrival of an old friend with a welcome present of eggs fresh from their hens, which of course gave us a wonderful excuse to sit down for a coffee and a good long chat. The days since then have fallen into our customary settling-in pattern of cleaning and sorting out the house and beginning to tackle the garden. The travelling pelargoniums are safely settled in their pots and my little flower border has survived the winter remarkably well. Once I’ve had time to tidy it thoroughly and the new plants I brought with me have bedded in, it should look rather pretty. The grass is another matter. As I've mentioned before, our so-called lawn is the remains of an old orchard, which is grazed all winter by our neighbour’s young stock and frequented by some of the most active moles I’ve had the misfortune to encounter. The combination of mole-hills and cowpats makes mowing an interesting experience at the best of times, but add to the mix the results of one of the wettest winters on record and mowing the grass may turn into an endurance sport. As the cattle milled around on the saturated grass trying to find shelter from the endless rain and wind, their hooves must have sunk into the ground over and over again, each time compressing a neat little hollow, surrounded by a crater rim, both of which have now hardened in the last few weeks of sunshine to the consistency of concrete. It makes walking across the long grass feel like traversing a cobbled street and trying to mow starts to resemble pushing a heavy weight across corrugated iron. It’s a good thing French mowers are built for rough ground! I hardly dare say this after the winter we've had, but what it really needs is a good long soaking to soften the topsoil so that I can level off the humps and bumps. Unfortunately all we've had so far is a couple of light showers, though this may change over the weekend, if the forecast is to be believed. Still, it’s good to be back and to realise that my French is getting better year by year, so that I can chat to the newsagent and read the local paper without feeling the need to reach for a dictionary. It’s good to have been invited to lunch by friends we met in our first summer here and to watch the cherries gradually ripening and even to catch a glimpse of one of the cats in the distance. It’s good to be back. …or we soon will be. The saga of our poor neglected campervan meant that we had to wait until all was well again before we could safely book our ferry crossing, so it was only at the end of May that we finally knew our departure date. Now, if all goes well, in a week’s time we will be once more ensconced for the summer in our small cottage in Normandy. Well, I say summer… As longer-term readers of this blog will know, the weather in southern Normandy is not very different from that in southern Britain. Maybe a degree or two warmer in summer and sometimes a degree or two colder in winter, but it is still recognisably a maritime climate and that means changeable. Not for us the settled expectation of hot sunshine in summer and freezing temperatures with snow in winter. As the old quip goes, we don’t have climate, we have weather and sometimes it seems as if we experience all four seasons in a single day. This makes packing for a summer stay an interesting conundrum. Yes, we can reasonably safely pack the swimsuits and leave the snow-boots at home. After that it’s anyone’s guess what the weather will throw at us. We’ve sweltered in September and had the wood-burner glowing and the hot-water bottles toasting our feet in July before now. We’ve had weeks of drought, with every drop of washing water saved for my rapidly shrivelling plants, and weeks of rain, with the grass growing to hayfield level before I get a dry day to cut it. So with my hand now healed enough for me to get on with the packing, I’d better start sorting the T-shirts and the sweaters, the sandals and the wellingtons, so that whatever the weather, we will at least be appropriately attired. Then we can start looking forward to the journey and to seeing our friends again, to eating different food, speaking a different language, and, in my case at least, worshipping with a different church community. Who knows? 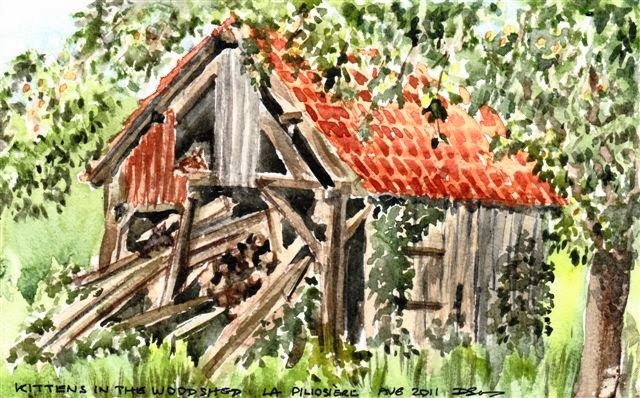 We may even have kittens in the woodshed again…. A day and a half ago I was halfway through drafting a new post about our imminent departure for France (a definite up) when I had to break off to get ready to go to lunch with two of DH’s former colleagues (another definite up). On our way home after a delicious meal and much enjoyable conversation, we stopped off in our little market town for me to collect a prescription from the health centre and return my library books. On my way back to the car-park the first down came out of the blue when I had a close encounter with the pavement! Coming down a slight slope my sandal skidded on some fine gravel and I landed heavily on the palms of my hands. I've skinned part of the ball of my left hand and have gravel burn on the other, so using my hands other than rather carefully may be more than a little uncomfortable for a day or two. It's so long since I had any gravel injuries I'd forgotten just how much they hurt. The silver lining was the knight in shining armour who stopped his car on the other side of the street, came across to see if I was alright and helped me safely to my feet again, despite having my left hand dripping blood rather close to his shoes. There are some very kind people in this world. The other and much sadder down came this morning in a phone call to DH from my devastated youngest sister. 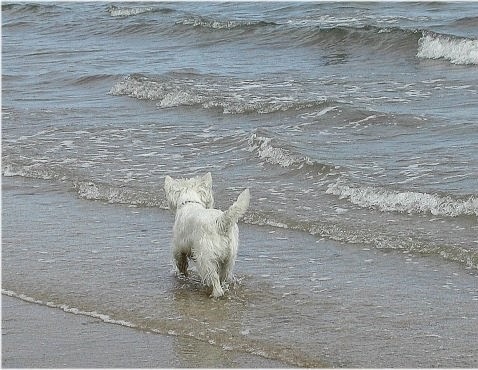 Her 12 year-old Westie had just had a general anaesthetic for a minor procedure and came round completely deaf. It's a known, but very rare, complication of the anaesthetic and more likely in older dogs like darling Edgar. It also won't get better. He's such a sweetie and I'm so sad this has happened to him. It certainly puts my fall into perspective. So I’m starting on the packing for our trip to France with sore hands and a mind full of a painful mixture of natural anticipation and real sadness. Life is never simple…. Come with me on the journey I made yesterday through the beautiful Welsh countryside to a remote and hidden valley, deep in the Berwyn Mountains. It lies more than two miles down a narrow, single track lane from the main road and to come to it is like stepping back through time and history. There, in a typically Welsh mediaeval church, you will find a shrine to a 7th century saint. Shrine, church and valley together make what the ancient Celts used to call a “thin place” – a place where it is easy to feel that two worlds meet. This is an ancient place. The circular churchyard, its very shape a sign of its antiquity, lies over a Bronze Age burial ground, dating back to around 1200BC. It is enclosed by a ring of venerable yew trees, which some of which have been estimated to be at least 2000 years old. It was here, so tradition and legend tell us, that an Irish princess named Melangell came to live as a Christian hermit in the 7th century and here that she was found at prayer by Brochwel, Prince of Powys, when he was out hunting. The hare he was chasing took refuge under Melangell’s skirt and the hounds fled. Brochwel, impressed by Melangell and her story, gave her the valley of Pennant, where she founded a small religious community and where, after many years as its abbess, she died and was buried. The valley was then named after her and the shrine of Pennant Melangell became a place of pilgrimage for centuries, until it was dismantled at the Reformation and its stones were built into the walls of the church and the lych-gate. The present church building, though much restored over the years, dates back to the 12th century and at its heart is the reconstructed shrine, its stones retrieved from their centuries-long resting places and reassembled where they once stood. It is again a centre of pilgrimage where people come to be quiet and apart in a place, where, as the poet T S Eliot put it, prayer has been valid. I was there for a Mothers’ Union Quiet Day and in the silence I discovered again the timeless beauty of a place I first visited nearly twenty years ago. and acutely conscious of the atmosphere of prayer. When we reluctantly had to leave, we drove home a different way, over the Berwyns, past Bala and its lake and back to our own bit of Mid-Wales, almost overwhelmed by the beauty and grandeur of the landscape of this little country in which we are fortunate enough to live.